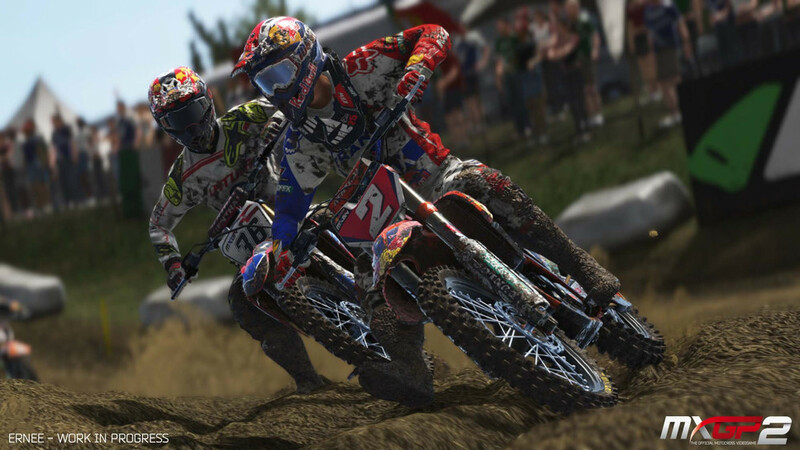 Tim tackles MXGP 2, the latest racer from prolific Italian studio Milestone S.r.l. It’s a fantastic sight seeing a horde of riders buzzing flatout around a Motocross track on race day, like a swarm of colourful hornets leaving long furrows in the track to mark their passing. And while you may not be able to smell the petrol wafting in the air the same as an actual event, Motocross games have come a long way in the last 10 years to replicating the thrill of the sport. Now, Milestone is back again with a follow-up to their 2014 title MXGP, this time with some new features and all the official tracks and teams from the 2015 MXGP and MX2 seasons. Things seem standard enough when starting the game for the first time. You get to customise your rider and your team off the bat, all the while having your manager nattering on about the team administration guff and how important he is (I must admit, they did simulate a manager rather well). Then it’s time to get into the racing, with all the usual suspects such as single race, career and time trial being present. 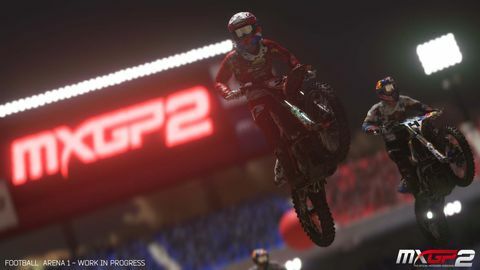 New to the MXGP series is Supercross racing, and with a couple of stadium circuits now available to race on, it’s a cool addition. There has definitely been some progress made in the years since the last game hit shelves. New features include realistic starts with no automatic countdown, and the ability to use the clutch. Milestone has also included three different physics models that are progressively more realistic, and the pro-level physics are an advancement in both realism and difficulty. There’s also the standard rewind button that comes in most racing games today, something that I ended up using far more than I’m used to. The physics still seem a bit wonky in places, particularly the air control. You should have limited control in the air after leaving the ground (enough to straighten the bike after a whip or a scrub), and while the trajectory seems to be mostly accurate when using the pro physics, you are able to successively twist in multiple directions while in mid-air. This is probably an unintended consequence of allowing players to manually scrub, but the result is that while airborne your rider controls as if he’s auditioning to be in a Tony Hawk game. The AI riders are brutish, and will not waver an inch from their chosen line into a corner no matter who gets in their way. While this leads to them knocking each other over occasionally (hilarious), they will also pile into you on the hairpins, before the ensuing freight-train of bikes do their best to turn you into a speed bump in the mud (not so funny). 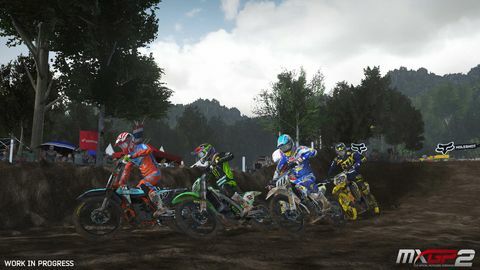 Compared to those for the player’s character, the AI animations look stiff and wooden on their bikes to the point where you can easily pick out your rider in a replay even when you’re taking an identical line to a computer opponent. There’s a team management system in the career mode where your objective is to appease sponsors by achieving point totals for events, but it feels like an afterthought instead of a necessary inclusion. It soon becomes apparent that failing to meet the objectives has zero consequences, as you can simply choose another cookie-cutter sponsor from the list, and besides, there is no difference between sponsors at your current level. After you receive yet another identical email regarding your performance in the last race, it’s apparent that this system should just have been discarded altogether. One of the big positives to come from this game being current-gen only, is the graphics have been given a makeover. The lighting engine has been updated, and the tracks overhauled with a longer draw distance and improved textures. 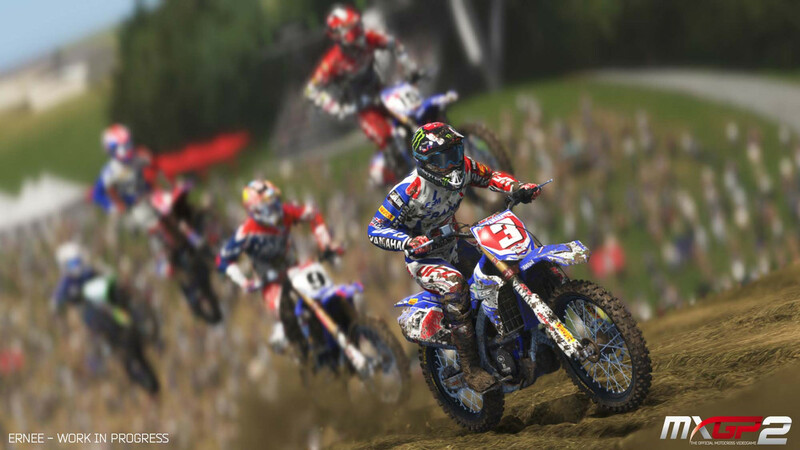 Though MXGP 2 lacks any visual wow factor, the game definitely looks the better for it. This fresh coat of paint comes at a too high a price unfortunately, but more on that in a bit. The loading times are maddeningly slow, and there’s a lot of them. Unfortunately this has somehow ended up being par for the course in many of Milestone’s titles, and consequently it’s just one more area where there was room for progress yet none was made. At least it hasn’t gone backwards though, for as you are about to discover, long load times and some questionable physics are the least of MXGP 2’s problems. Everything mentioned up ‘til now has been adequate if uninspired, but this game’s rotten performance deals a killing blow to any hopes it might have had. The frame rate on the Xbox One version is abysmal, and while the time trial mode seems to be able to sustain an average of 30fps, competing on the same tracks with 21 other riders sends the frame rate plummeting at regular intervals. Some circuits do seem to be more affected than others, but the experience taken as a whole will require the patience of a saint to endure. Did I mention there is rewind button? Yeah, you’re going to need that. As it stands, the performance is unacceptable for any console game release, let alone for a racing game that requires such a surgical level of control in order for the player to remain competitive. When this misery is combined with the difficult handling model and bolshie AI, playing the game feels like fighting an uphill battle on the slopes of Everest. It’s about as far removed from fun as it comes, with the small improvements made in other areas nullified by the chugging visuals. The easy answer here would be to buy the previous MXGP and ignore this one, until you realise that the last game was never released on the Xbox One platform. Xbox users have well and truly been shafted this time around as there are currently no alternatives to this half-pie effort, at least until the inevitable sequel. And that’s really bad news, as without competition in the genre, there’s nothing keeping Milestone from repeating this disaster again. Ups Pro-level physics and manual body positioning provide a tough challenge. Stadium circuits and Supercross racing make an appearance. Manual starts and the ability to use the clutch have been added. Downs Atrocious framerate problems makes the game borderline unplayable on some tracks. The team management is pointless. The AI riders seem to think their bikes are bulldozers. The air control needs a lot of work.